Advanced civilizations appeared suddenly, mysteriously more than 5,000 years ago in at least six places around the world—Babylon, Egypt, China, India, Peru, and Mexico… and they came with a flourish! Lavish temples and majestic pyramids emerged suddenly, inexplicably out of barbarianism and nomadism. Moving these massive stones and surgically tailoring them to fit together perfectly without mortar could have been done only with highly advanced technologies. Even today it would be a near-impossible feat. 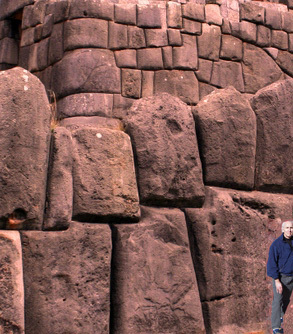 These are among the Sacsayhuaman ruins near Cusco, Peru. The general consensus is that the stones were assembled 500 years ago by the Incas, but that’s not even close. When reliable dating is done someday, archaeologists will probably discover that this wall is at least 5,000 years old. After all, some of the oldest known pyramids on earth were built nearby (also in Peru) at that time… and I suspect the Atlanteans had a giant hand in it all, as we saw in the previous article. 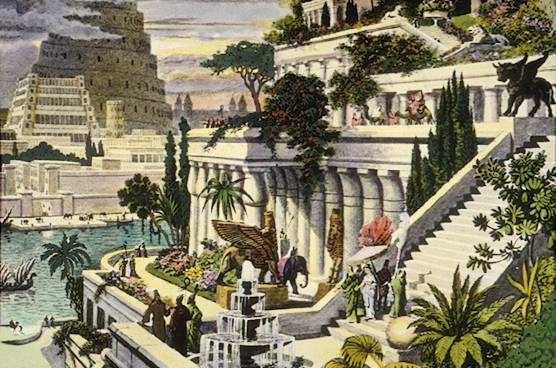 The hanging gardens of Babylon and the famous tower of Babel are believed to have been built at least 4,000 or 5,000 years ago. Again, the Atlanteans (or some other superhuman force) had to have been involved. Building the Great Pyramid at Giza, the ultimate landmark of this world, would have required herculean strength and technology as well. Egypt was the primary beneficiary of Atlantean knowledge. Unlike desert ruins, which stand the test of time, temples and pyramids in more verdant areas are soon overrun by vegetation and covered in fertile soil. The Chinese pyramid of Qin Shihuangling, for example, doesn’t stand out as starkly today as the Great Pyramid at Giza, but it covers about twice as much ground. Though it’s age is officially estimated at 2-3,000 years, I suspect it’s at least 5,000 years old. 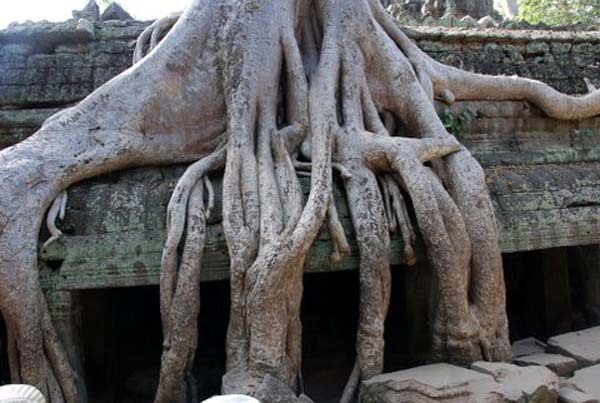 Many of the ancient temples throughout the Far East, like the Prom temple in Cambodia, have been overrun with soil and vegetation over the millennia. 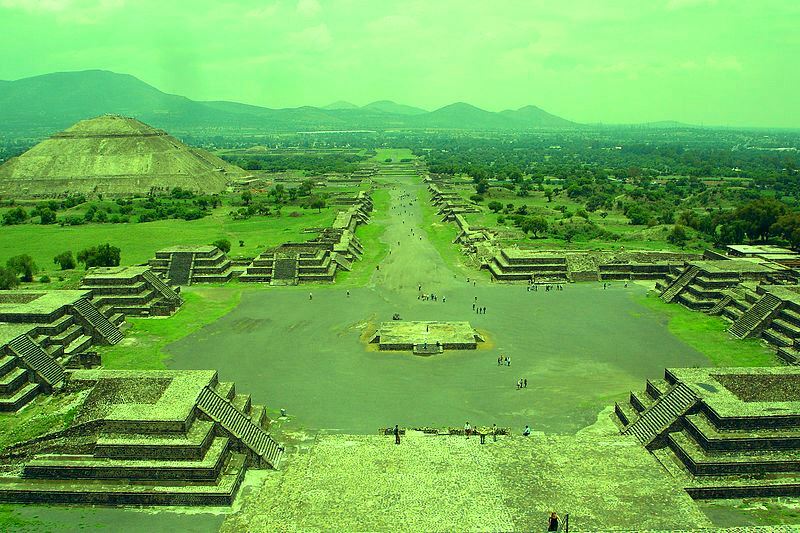 The Pyramid of the Sun in Mexico (background) is another testament to Atlantean technologies. Like its Egyptian cousin at Giza, the Pyramid of the Sun has a passageway below it, perhaps where an Amenti-like portal allowed the ancient gods (Atlanteans) to rejuvenate their bodies. 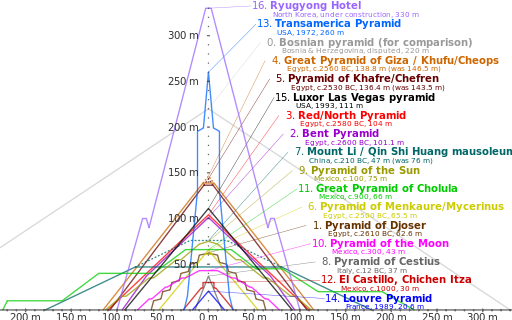 This diagram shows the relative shapes and sizes of some of the world’s most notable pyramids, including a less heralded (and controversial) Bosnian pyramid that dwarfs the rest. 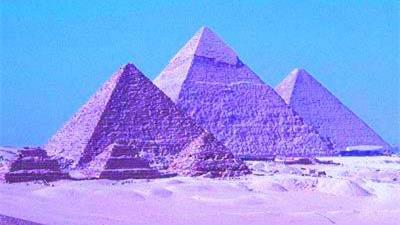 Science today can’t venture a reasonable guess as to how these and other ancient wonders were created. Archaeologists simply call it “crossing the great divide” from cave-dwelling to civilization. Exactly how civilization emerged from barbarism and nomadism is the guiding question of all archaeology. Suddenly, 5,000 years ago crowds of people were congregating in organized cities with lavish infrastructures, involving themselves with writing, math, pottery, art, and monumental architecture. They had leaders to keep order and armies to protect society from invasion. Well, as you and I are now aware, though mainstream science has yet to determine, the original infrastructure and leadership that opened the Second Epoch in various parts of the world were provided by Atlanteans who, after destroying their own advanced culture, committed themselves to lifting the “hairy barbarians” out of darkness. They planted seeds of wisdom, knowledge, and technology in those early cities that would slowly sprout, over the centuries, into modern civilization. This entry was posted in Our ancient heritage, Politics and Economics, Science and Technology, Society and ethics, Worldly matters and tagged amenti, ancient india, ancient Mexico, ancient Peru, Atlaneans, Atlantis, Babylon, China, Chinese pyramid, civilization, Egypt, Giza, halls of amenti, prehistoric civilizations, Pyramid of the Sun, Sacsayhuaman ruins, Tower of Babel. Bookmark the permalink. Ta Prom temple is not from India, but Cambodia. Thanks Che, I corrected the article. and other websites that you find by google-surfing……….. Sorry to say, I don’t think I have here on this site the kind of information about pyramids you’re probably looking for. Good luck in your search!